I found this a very readable book with lots of strange and interesting narratives and statistics. It questions many assumptions which may have become so entrenched that we are not always aware that they are assumptions not truths. The book starts off with the thesis that humanity everywhere was poor and sick with little change up till c200 years ago and that there has been a worldwide expansion since then in wealth and life expectancy. The mediaeval concept of Utopia has become harder to sustain as we have much more and are beginning to suffer from surfeit – leading to climate change and obesity. Bregman characterises the Land of Plenty with the marketing of stuff we don’t need, sameness of politics and the cult of the individual rather than of ideals. Capitalism, he states, opened the doors to the Land of Plenty but can’t sustain it, so that we need to return to politics and rediscover ideals and community. ​Key to his proposals is Universal Basic Income. He quotes various experiments including one by the homeless charity Broadway which gave £3,000 pounds each to 13 long-term homeless people – this proved both cheap and successful. Givedirectly and other programmes give money directly with no strings to the poor – why shouldn’t they know better what they need? He also refers to the success of the Mincome UBI experiment in Canada which was ended when a new conservative government came to power. There was evidence of the programme’s success in lowering health problems. He argues that the mechanisms of the welfare state have operated to keep the poor dependent and that the perception of scarcity acts to keep a focus on the short-term. In its impact on the individual, poverty (even relative poverty) reduces one’s ‘mental bandwidth’ so that one doesn’t have the energy to do things such as applying for bursaries which could produce long-term benefit. Scarcity may be in perception rather than reality and tends to depend on comparison with what those around have – this being one of the many dangers of inequality. Further relevant examples are that Utah has nearly eliminated homelessness by giving the homeless free apartments. This experiment was repeated in Amsterdam. There are more empty homes than homeless. Bizarrely, Nixon was in the process of introducing a UBI when he was advised of the Speenhamland project and he was influenced by the analysis he was given of this experiment in England in the early 1800s and altered the proposals to workfare. The guarantee of income made at Speenhamland was said to have led to laziness, improvidence, and more babies. This analysis has become entrenched in thinking including that of Malthus and Marx. More recent research however has questioned both the methodology and the findings of the government review of Speenhamland and suggests it was actually a success. However, the belief that free money will lead to improvidence has become deeply entrenched and can be seen in underpinning beliefs that the poor should always earn money, deserving and undeserving poor, those not working should never have more, means-testing etc. UBI starts from a different premise. “Capitalist or communist, it all boils down to a pointless distinction between two types of poor, and to a major misconception that we almost managed to dispel some forty years ago – the fallacy that a life without poverty is a privilege you have to work for, rather than a right we all deserve.” (p97) Bregman proceeds to critique the concept of GDP as a measure of anything worthwhile in a manner reminiscent of Katrine Marcal and ‘Who Cooked Adam Smith’s Dinner’. One of the interesting facts quoted is that Denmark is the only country which has ever attempted to calculate the value of breastmilk. GDP, Bregman argues, measures banks’ productivity in terms of their risk-taking behaviour – the more risk the more production in GDP terms. GDP as a concept was invented in the 30s and 40s in the US and its concepts of measuring national income are rooted in financing war. He goes on to look at a range of alternative measure including the Happy Planet and suggests that what is needed is a ‘dashboard’ of different measures that will attempt to measure contributions to wellbeing, sustainability etc. He also argues that we need to develop a more sophisticated concept of growth that looks at quality as well as quantity. Bregman also argues that whilst we may become better at producing things more cheaply we cannot increase the productivity of, for instance, music. Thus, there will be an inevitable tendency as countries become richer towards the expansion of public sector activities such as health care and education and the lessening of traditional industry. We should see that as an opportunity not a problem. Bregman draws a comparison between industrialisation and the rise of automation and the current development of IT technology – the ‘second Machine Age’ – saying that some of the fears of the past were rising again and challenging some things which have come to be thought of as always stable such as the proportion of national wealth going into salaries as compared to profits. Globalisation and technological growth are leading to a lower proportion going to salaries and he suggests also that technological advances have led to a smaller number of larger producers. (This could be to some extent contradicted by the recent rise in small industries such as craft breweries?) Whilst until recently new jobs have emerged as the old ones went. Bregman says that this has sopped and that the only new safe jobs now are low paid ones such as barista or carer. There has been as erosion of average jobs and of the middle class and a new group of the precariat and that the situation is reminiscent of the time of the Luddites. So what are his solutions if jobs are really disappearing now? His answers lie firmly in UBI and in a shorter working week and he claims that the only alternative to growing inequality lies with a massive redistribution: of money (UBI), time (shorter working week), taxation (on capital rather than labour) and of robots (so that they benefit everyone). He goes on to talk about the very recent (last 20 years) development of randomised controlled trials to produce evidence of what foreign aid works, saying that until this work started being done by ‘randomistas’, especially Esther Duflo, we really had no idea what was effective. The basic assumption of the randomistas is not that humans are rational (Marcal again?) but that they are quixotic. Then the next assumption to be debunked is of the negative consequences of migration. Bregman advocates open borders as the best way to eradicate global poverty. Globalisation creates open borders for everything except people. He looks at the fallacies which prevent change, and states that migration reduces terrorism and crime rates, that poverty, unemployment and discrimination, not diversity, cause a lack of social cohesion. That migrants do not take our jobs nor force wages down. There is no evidence that immigrants are more likely to apply for benefits and that open borders also make it more likely that people will return home. 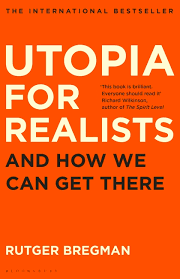 The book ends with a look at how to make utopia happen and he uses the concept of the Overton Window to show how innovation can be limited. Yet extremists such as Donald Trump have been able to shift the window by being so far out that anything else seems reasonable. For the left he says that many have retreated into ‘underdog socialism’ where they attempt to quash any radical ideas for fear of losing votes. The left needs to reclaim the language of progress and his twin recommendations are to organise and to keep arguing despite put-downs. This last bit had a strange synchronicity with recent events! I found this a fascinating book although at times it felt a bit unsatisfying – perhaps because of the pattern of debunking assumptions with an amusing historical anecdote.